A Day With Us — Red Barn Children's Center Inc. Your child's day begins at 9:00 (or no earlier than 8:00 a.m. if using before care). Activities start promptly at 9:10. 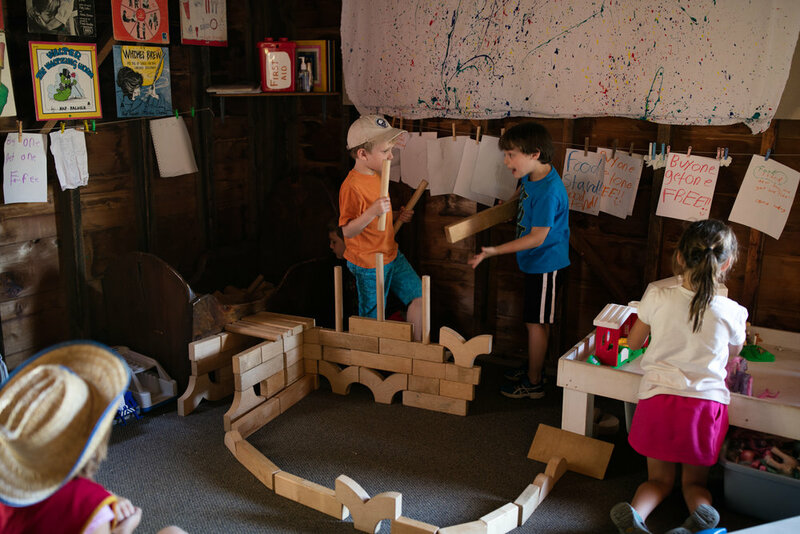 Your child's barn will either be going to the pool, the playground, heading outdoors to explore or play cooperative games, or will be beginning dramatic play and art time. Each barn rotates through similar activities during the day and no group occupies the same space as another at the same time. Each Barn plans their art and play activities around weekly themes. In the past some of these themes for the preschool children have been movement based, such as over and under and up and down. They have studied particular artists and/or various forms of art. School-age themes have included the Olympics, landscapes and the Continents. Included in your tuition cost, a mid-morning and an afternoon snack are served to fuel the children through their activities. Little Barn children enjoy their lunch inside their air conditioned classroom. Gray Barn children enjoy a picnic lunch outside on shaded picnic tables on the Wishing Wall Terrace. Big Barn children also eat outside under the shade of our evergreen trees near the head of the exploring trails. A short rest time follows all lunches before the children return to the day's activities (rest time is required per state regulation). Many of the afternoon activities mimic morning routines with some slight variation in time allowance or topic. This allows those children only attending in the afternoon to experience many of the same activities as full day or morning only children while changing the routine just enough so the all day children maintain interest.